BAJA NEWS: Since 2007: Happy Taco Day! Happy Taco Day! Yes, it’s Mexican Taco Day, El Día del Taco, an opportunity to celebrate a dish that is a key element of the Mexican identity, and one that comes in hundreds (thousands?) of variations. Among the best known are tacos al pastor, a variation on the Arab shawarma or the Turkish doner, a taco whose big flavor and low cost are enough to bring on “a religious experience,” according to SDP Noticias today. Not only is their consumption religious but nutritious as well: scientific studies (sources were not revealed) have shown that an order of five small tacos al pastor has far more nutritional value than a granola bar, and each taco contains just 93 calories. However, as such an order can only be accompanied by a beer, the caloric information can be misleading. dish not only as a great meal but as an antidote to intoxication as well as a cure for hangovers. The taco, of course, goes back much further than even Televisa itself. It dates back to pre-hispanic times when it was realized that a filling rolled up in a corn tortilla was easy to transport and simple to prepare. As for fillings, there is no end to the ingredients that can make a fine taco and every region of Mexico has its specialties. Carnitas, loganiza, carne asada, cochinita, árabes, barbacoa, cabeza, lengua, tripa, ojo, pollo, chicharrón, cansta, placero, de guisado, campechanos, pescado, camarones, con arroz, de chile relleno, cecina, queso fresco, aguacate, adobo, huevo, de gusanos de maguey, suadero, charales, chilorio, marlin — and that’s just a start. Some of those fillings might meet with some resistance among the more squeamish — brains, eyes or worms, for example — but there’s plenty there and plenty more to satisfy the cravings for a taco. 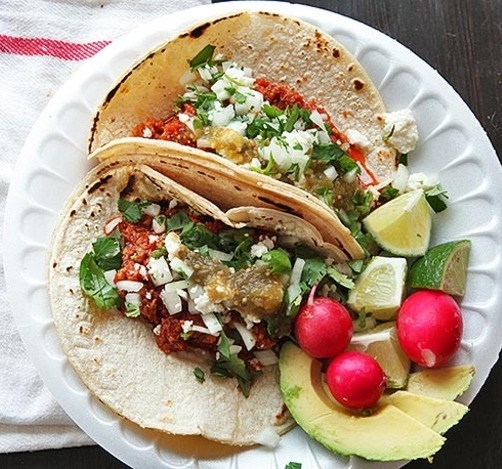 A source of national pride and one that is symbolic of Mexican gastronomy, the taco is one of the few dishes in the world that combines flavor, originality, variety and presence, says El Universal in its tribute to Taco Day. But why is the date not widely known and celebrated? Perhaps because every day is Taco Day in Mexico. - Provecho.